This makes me realise that Richard himself was probably involved in selecting tracks for early international compilation albums. When I was young, I always assumed that local record companies had made the choice of songs. 'Great Hits of The Carpenters', released in Australia in early 1972 to tie in with Carpenters' tour, (when they had only five bona fide hits), included some of these tracks that Richard named as strong, (and they were):- 'Help' and 'Baby It's You', (as well as 'I'll Never Fall in Love Again' and 'Eve', the best from 'Ticket to Ride'). Of course, with less than twelve personal hits to fill the record, the idea was probably to make sure that all the 'filler' tracks had been hits for other artists, which all those other tracks named had, (apart from 'Eve', of course). The album reached the Top 10, just missing the Top 5, from memory. 'Hurting Each Other' then became a Top 5 around the time of the tour. When 'The Singles' was released internationally, it was not released in Australia, because half the songs had been on 'Great Hits of The Carpenters' eighteen months before. Instead, 'Great Hits of The Carpenters Vol 2 1969 to 1973' was released, once again, with songs from 'Close to You' that Richard has named as strengths. It included 'Reason to Believe', for one. 'Top of The World' had been a massive Number One smash the year before and its 'B' side, 'Love is Surrender', was included on 'Great Hits of The Carpenters Vol 2'. (I don't know if this 'B' side was ever played on the radio. If so, I never heard it). Also included was 'I Kept On Loving You', ( which was the original 'A' side of 'Close to You', I think), and the song from 'Carpenters' that was later thrashed as a TV station theme, (not Carpenters' version, though), 'Let Me Be The One'. This second compilation was not as successful as the first but still reached the Top 20, from memory. It's actually the first album that I ever owned - an all-time favourite. It may have burned up in the Osborn fire with a lot of other things. We know the master tape did---but considering that Richard has acetates of quite a few other Magic Lamp recordings (like The Parting of Our Ways), could he have an acetate recording of the Magic Lamp Reason to Believe or even a cassette version (maybe it was on the demo that Herb Alpert heard). Of course, the ultimate thing could be that just like Your Wonderful Parade and All I Can Do there was a copy made of the Reason To Believe Magic Lamp tape, and parts of it were used in the A&M version (just like Your Wonderful Parade is made up of the drum, bass, cello, solo, keyboards and background vocals from the Magic Lamp recording with just a new lead and real strings). 'Great Hits of The Carpenters', released in Australia in early 1972 to tie in with Carpenters' tour, (when they had only five bona fide hits), included some of these tracks that Richard named as strong, (and they were):- 'Help' and 'Baby It's You', (as well as 'I'll Never Fall in Love Again' and 'Eve', the best from 'Ticket to Ride'). Baby It's You also appeared on the 1978 Canadian Carpenters Collection (it closed out Record 1 Side 1) and its kind of an odd choice for the album, as the only other "filler" album tracks are A Song For You & Piano Picker (and at the time I Just Fall In Love Again was an album-only track). All the other tracks on the 2-disc set were either A-side or B-side singles or future-B-side singles. (just like Your Wonderful Parade is made up of the drum, bass, cello, solo, keyboards and background vocals from the Magic Lamp recording with just a new lead and real strings). The demo version and the official album track couldn’t sound more different to me. The demo sounds slower and the vocal in a lower key, more draggy, more bassy, with more echo. On the album version Richard’s lead sounds faster, more nasal, whiny and high pitched. Was the whole backing track sped up for Offering? I do think that 'Baby It's You' is a great song and performance, though, and a possible contender for a single, although nowhere as strong as 'We've Only Just Begun', 'Close to You' or the later singles from the 'Capenters' LP. I hear a big difference in them too. You would be surprised what EQ-ing, shifting stereo and spacial information (ie. reverb/delay) can do. When the lead is delivered with more energy it makes the harmonies/backing parts come alive too. Honestly, it's hard to know for sure what was kept from the demo because it's a bit muddled. But, a proper mix with a strong lead can make all the difference in what your hearing. These liner notes don’t really explain anything. The two versions of the song sound completely different, the album version sounds sped up. The drum, bass, cello, solo, keyboards, and background vocals on Bettis’s and my 1967 anti-establishment song, Your Wonderful Parade are from the demo done in Joe Osborn’s garage studio. Only a new lead and real strings were added. All I Can Do is the demo in its entirety. Both were recorded in 1968. The only things from 69 were the new leads and the strings. And from what I hear, it sounds like for Ticket To Ride Richard may've had the Magic Lamp master played at a faster speed, and he recorded his vocals for the slightly faster speed. One thing that I've noticed on Your Wonderful Parade from Ticket and even the 45 version on The Complete Singles is that the end drums sound really quick and distorted, and have almost a 60's Trek phaser sound to them, whereas the demo version does not have that sound. One thing that I've noticed on Your Wonderful Parade from Ticket and even the 45 version on The Complete Singles is that the end drums sound really quick and distorted, and have almost a 60's Trek phaser sound to them, whereas the demo version does not have that sound. I read that the drums happen to have done that when they were mixing it for "Offering/Ticket to Ride." Both KC and RC didn't mind the distortion, so they kept it in. It's a matter of taste I suppose. It's like one of those things Rich would probably say "sorry!" if you didn't like it. FAN: In the song “YOU”, there is a piano fill (repeated throughout the song) that follows the phrase “…you are one of the few things worth remembering…”. During the [first] fill, there is a rather audible “creaking” sound heard in the track. Can you explain this? Richard: There is a noise there. I can't remember what it is, but obviously something we couldn't remove in mixdown. So sorry! I don't hear "Wonderful Parade" as having been sped up; although, I havn't analyzed it with waveform audio. I'm sticking to Richard's re-recorded lead, EQing, further mixing techniques contributing to the changes we're hearing... and A&M approved. But that’s the thing. The drums were from 68—they weren’t recorded at A&M. What was released on Ticket and the 45 seems to have been sped up, eq’d and mixed at a different level than the demo. Instead of 15ips the drums seem to have been mixed back at 20ips. I know what you mean. There's some possibilities at play here. 2) Maybe A&M had better technology to restore what they had in '69. I don't think it would be worth their time to re-record drums or other instruments. 3) Could it be that Richard put the process in layman terms; "I added strings and re-recorded my vocals" rather than explain every detail that was used to fix it up?? We know his memory doesn't typically fail him, so he came up with an answer that could fit in the liner notes and/or be easily understood. I'll have to take a look at wave forms to better judge the speed. Sorry to derail this thread! I promise I'll bring it back. I compared the demo and album release of "Wonderful Parade" in waveform audio stacked against each other. Clearly the album version is a bit faster. The drums don't look to be re-recorded because the waves look too similar (the demo's drum waves are slightly longer). So, they do not sync up exactly. You can start them at the same time with Karen's "1,2,3" and line up their final "paraaaaade" overdub pretty closely. Other than that it's really unpleasant playing them at the same time. Looks like "Parade" has been sped up OR some of the drum hits were edited out to have the cues come in a bit earlier than what was on the demo. I can't say for sure, but what I surmise is the demo was an old transfer. Any effort to restore it or add additional reverb/delay didn't help with the speed obviously. In it's time, once they got signed to A & M the technology it was enough for Richard to bring up just a touch. As I said, his improved re-recorded lead makes those harmonies sounds a lot better than what's on the demo. Other than that it's not much different other than his spoken intro, re-recorded doubled lead, new strings and distortion on the drums as noted. A better question is: why did we get a bum version of the demo? After analyzing, this doesn't help improve my feeling towards the song. I know it was Richard's pet project at the time, but was it worth being a single? It's unfair that The Carpenters were painted with this "they don't make any mistakes" brush. I don't think it was healthy for them to have to think of maintaining that Mikey Mouse standard. It's something they fought against (their image). This has kept more studio demos and unreleased tracks from being enjoyed by die hard fans. There are a few technical glitches even on the critically acclaimed "Close to you album." It is listed by Rolling Stone as one of the greatest albums out of a list of 500. BUT, on "Crescent Noon" there are some clicks and noises, for example. However, it doesn't distract too much. The Remix of "Baby it's you" was well worth it to clean it up a bit! [I think of it as pitch perfect, but Richard calls it relative pitch]. Other times leaves me wondering why some of the vocal parts seemingly protrude as much as they do. Like in "Never fall in love again"... why is Richard harmonizing in the left stereo field throughout (almost) with fairly low volume? There's no reason for it to my ears. While they were chasing sound with all the added voices; in the long run, that would contribute to exhaustion (vocally/physically, mentally, emotionally). At the end of the day, they were as close to perfection as humanly possible, and the Richard of today shouldn't have a care in the world about these little technical things. It is what it is. We still enjoy it. I'll always cherish them, and especially for the tedious work Richard had to do! Just think of it for a moment how nearly obsessive it is that he remixed again and again. Nothing about recording is easy. The C's would relish in the technology these days. Endless amount of tracks and clean pick-up to do whatever they could imagine. And still not come out nearly as good as KC and RC! The fact that he compiled "Offering" within a 5 month time frame with everything he wanted to do in his head at age 23 is really, really good. The man's a genius. By the time, of "Close to you" both their skill sets (preparation) and good song selection/promotion (opportunity) sent them to the moon (success). That's fine if you want to have a laugh. Technically it shouldn't be quicker based on what we were talking about, "I only added strings and new lead vocal." Not to mention, we don't know the origin of the Demo. If you were to analyze audio I wouldn't LOL at you for it. To each their own, but I won't be doing so around here again. Our brains deceive us, so I wanted to look at the evidence. Not sure why that's funny. Considering that, according to the “As Time Goes By” notes for “California Dreaming” mention that that song was recorded on 4-track (and CD was transferred to 48-track in 1999), it reasons that “Your Wonderful Parade” was recorded at Magic Lamp on 4-track and then transferred to 16-track, which A&M seems to have been using at the time. So for the “From The Top/Essential Collection” the demo was probably on a 16-track, and at that Richard would’ve had 12-tracks open for the new vocals and strings in 69, and a new mix down. I doubt he would’ve used the mono audio cassette that was sent to A&M (that he used for “Nowhere Man”, plus on FTT/TEC YWP demo is in stereo). Also, with the 4-track, that would mean that the drums are probably mixed with some other instruments, unless Richard had the drums on one track by themselves, and considering that he was able to use the 68 background vocals those were most likely on their own track. So for the demo, 2 of the 4 tracks were most likely dedicated to the vocals. The other 2 would’ve been the instruments. 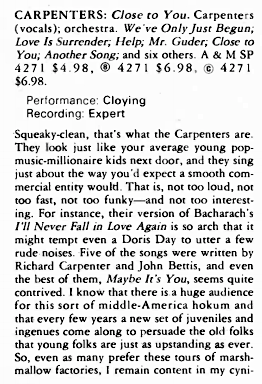 I think it's safe to say that Stereo Review really did not like the Carpenters back in their days. I'd love to re-read the Stereo Review about the Special Edition of CHRISTMAS PORTRAIT. As I recall, it said something about the choir on "Ave Maria". ...typical critical drivel. "Those who can, do, those who can't, critique others who can." It's clear that Morgan Ames knows how to write an album review. I'm not just saying that because his review is mostly positive. The MUSIC is his focus and he never gets sidetracked. That is simply ridiculous, as most of the drumming is Hal Blaine on this album. It just goes to show that critics may not always be well rounded musicians and can only review through the glasses of what they like best, especially when they are factually incorrect. Sometimes, I wonder if they actually listen to the product since it is hard for them to digest. I’ll Never Fall In Love Again is one of my favorites from Close To You. The voicing is extraordinary, picture perfect! Baby It’s You is my least favorite, but I still like it. Help is a great album version but after Ticket, I’m glad it was never a single release. I never get tired of this album and I usually play from beginning to end. For example, if I choose to listen to this version of We’ve Only Just Begun, once it continues to Love Is Surrender the album is on for the duration. The album places a pleasant aura over my head that seems to overtake my body and it stimulates all my listening senses. I like this album as it is, and prefer it over any remix. Not all the overdubs are used in the remixes and the drums and bass sound too prominent for my tastes. I love the use of stereo separation on left and right channel on the overdubs. Now and Then has a similar appeal in this regard. I don’t recall at the moment for the albums Carpenters or A Song For You although the Single version of Top of the World does, and the overdubs on the song A Song For You and Bless The Beasts and the Children are among my favorites. One Love even has a unique appeal. They are full of rich overdubbed layers of sound with left and right separation like the Close To You album and sounds great today on today’s audio systems! Close To You. Album .Chart Facts.